Mentor Corporation, originally launched its Puragen ™ dermal filler product in Europe in May 2005, with the UK launch in October 2005. As a result, you may only come across a few practitioners using this product currently. Puragen™ is a non-animal based hyaluronic acid gel that is injected and intended to smooth lines, banish wrinkles, plump lips or fill depressions and scars. A sister product from Mentor, Prevelle™, was also launched in 2007. 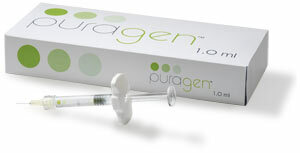 Puragen™ is a non-animal based, hyaluronic acid dermal filler derived from bacterial fermentation. It is created using a breakthrough technology from Mentor Corp called DXL™. Hyaluronic acid, in its natural state, is absorbed by the body within 1-2 days. To make hyaluronic acid last longer, some dermal filler products are composed of single cross-linked molecules. However, the patented DXL™ process double cross-links hyaluron molecules, providing greater resistance to degradation than single cross-linked products available. DXL™ therefore increases the resistance of Puragen™ to breaking down as the doubled network of molecules is not absorbed by the body as quickly, giving Puragen™ a longer lasting ability according to the manufacturers. They also state that Puragen™ is the only dermal filler product which depends on double cross-link chemistry, not particle size, to make it last longer. Puragen™ is approved as a CE-marked Class III medical device in Europe for the correction of facial wrinkles, folds, and lip enhancement. FDA approval in the US is currently pending. Puragen™ is commonly used to add volume, smooth wrinkles and restore fullness in the glabellar lines (frown lines between the eyebrows), nasolabial folds (nose to mouth lines) and the lips. But Puragen™ is suitable for treating virtually the entire facial area for wrinkles, lines, depressions, and scars or for shaping facial contours. Puragen™ Plus, which contains lidocaine, a local anaesthetic, will be released in the near future according to the manufacturers. If you have had laser treatment or a chemical peel, it is recommended to wait until the treated area is totally healed, generally 6-8 weeks, before having treatment with Puragen™. Treatments are designed by the manufacturer to last a minimum of 6 - 8 months, and can last much longer; with clinical studies indicating as much as 1 year. Lip enhancements may not last quite as long though. The length of time Puragen™ will last depends on various factors such as the structure of your skin, lifestyle, age, treatment area, and the injection technique of the practitioner. Transient erythema (redness), swelling, pain, itching, discoloration or tenderness at the implant site. Typically resolution is spontaneous, within one or two days after injection into the skin. This depends on the area treated and how much is required, and the practitioner doing the treatment, but price ranges are in the region of £300 per syringe of Puragen™. Click for ALL Puragen ™ clinics in the UK & Ireland registered and verified by Consulting Room.